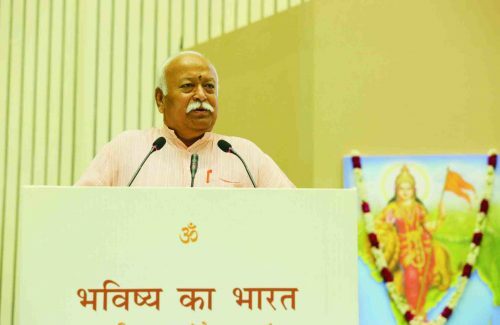 NEW DELHI, September 18 ; Rashtriya Swayamsevak Sangh Sarsanghchalak Dr. Mohan Bhagwat today elaborated on the concept of Hindutvawhile presenting the RSS’s future vision during his address on the second day of the three-day lecture series on topic ‘Future of Bharat: An RSS Vision’ at the Vigyan Bhawan. A galaxy of eminent personalities attended the event. “The Hindu dharma is actually a universal dharma, based on humanity as a whole. We have never considered ourselves different from the entire world. ‘Vasudhaivakutumbakam’ is the basis of Hindutva,” he said. Hindutva is simply the concept of universal brotherhood.